Is Zinc Good for Hair Growth? 4 Is Zinc Good for Hair Growth? There is a common misconception that you'll have difficulty meeting your protein needs through plant sources alone. Nearly every plant food contains some protein. As long as you consume a wide variety of plant protein sources, you will not only meet your protein needs but will also devour a plethora of other health-promoting nutrients while doing so. Black beans, pinto beans, kidney beans, chickpeas, great northern beans, lima beans, navy beans, lentils and split peas are all members of the legume family. A 1/2-cup serving of cooked legumes provides 100 to 150 calories and 5 to 10 grams of protein. 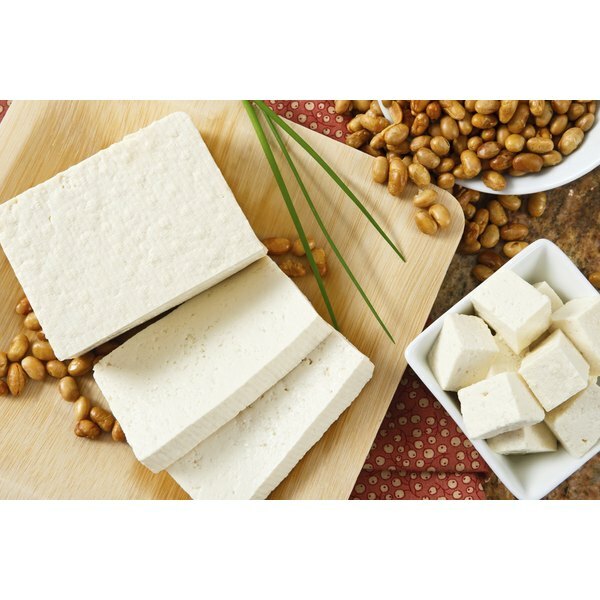 Soy is a member of the legume family, but unlike many other plant proteins, it provides all nine essential amino acids. One-half cup of cooked soybeans contains roughly 150 calories and 15 grams of protein. Pistachios, almonds, cashews, walnuts, pecans, hazelnuts, pine nuts, chia seeds, flaxseeds, hemp seeds, pumpkin seeds, sesame seeds or sunflower seeds contain about 160 to 190 calories and 6 to 10 grams of protein per 1-ounce serving. Although nuts and seeds are packed with protein and other nutrients, they are also high in calories and fat, so keep your portions petite and limit yourself to one to two servings per day to control weight. Whole grains contain up to 6 grams of protein per 1/2-cup serving, so consuming the recommended six servings of grains per day can contribute significantly to your daily protein goals. Examples of whole grains include wheat berries, wheat bulgur, brown rice, oats, buckwheat, barley, farro, whole-grain bread, whole-grain breakfast cereals and whole-wheat pastas; each provides 2 to 6 grams of protein per 1/2-cup serving. Quinoa stands out as a whole-grain protein source in that it contains all nine essential amino acids, just like the soybean, and provides 4 grams protein per 1/2-cup serving. The daily protein requirement for most healthy adults is 0.8 grams of protein per kilogram of body weight daily. For example, if you weigh 150 pounds, you need approximately 54 grams of protein daily. In addition to providing protein, plant foods are packed with beneficial vitamins, minerals, phytochemicals and fiber; they contain no cholesterol and very little saturated fat and sodium. Everyone can benefit from obtaining more protein from plant sources. Kassi Swallow began writing professionally in 2013. She contributes to websites such as Answerbag and LIVESTRONG.COM. Swallow is a Registered Dietitian with the Academy of Nutrition and Dietetics and works as a Nutrition Consultant. She received a Bachelor of Science and Master of Science in nutrition from the University of Maine. How Much Whole Grain Should You Eat a Day?